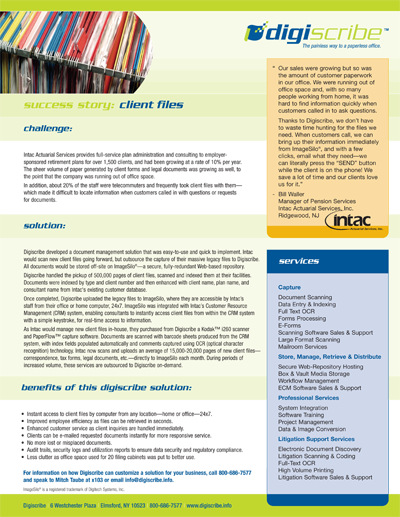 Digiscribe wanted a series of client success stories to show how their electronic data management (EDM) products helped to improve business operations for their customers. Using a Challenge / Solution format, we added quotes and a bullet list of benefits to resonate with both current customers and prospects. We also developed a series of direct mail postcards to increase clients’ awareness of the benefits of using EDM. 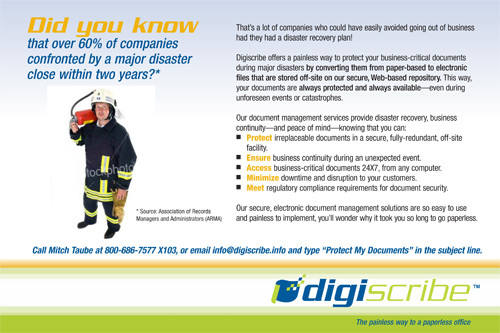 Using a catchy “Did You Know?” theme, each postcard promoted a specific customer benefit, such as cost savings, data protection, and Digiscribe’s “green” initiative to save trees by using less paper.